I love pichi-pichi. It is part of my "happy food" category, because whenever there is a birthday celebration in my previous job in Manila we'd have pork barbecue, spaghetti, palabok, and pichi-pichi. Only one bilao of pichi-pichi is usually served, and runs out really fast! 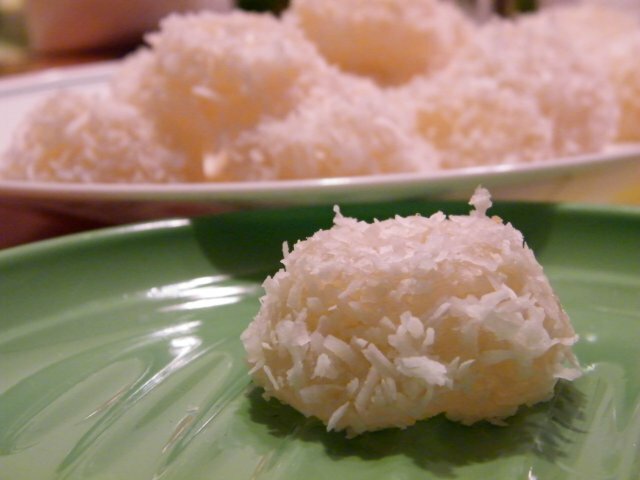 Can't get enough of the sweet, soft cassava encased in shredded coconut. It was my first time to cook pichi-pichi yesterday. I must say, it's one of the easiest things to make. Perhaps it's because I got store-bought grated coconut meat! The tricky part is the steaming process as it's all about safety. Aside from the dried coconut meat, I took other liberties with this recipe. I did not use lihiya or lye water, which is essentially caustic soda (or potassium hydroxide). Pichi-pichi recipes call for this ingredient but I am not familiar with this so I skipped it altogether. Also, I used Pandan Flavouring which I mistook for Pandan Extract. The latter must be a concentrated version and so would work much better I think. But Pandan Flavour's what I had in the pantry and so that's what I used. At any rate, I noted the measurements below. But the proof of the cooking is in the eating! 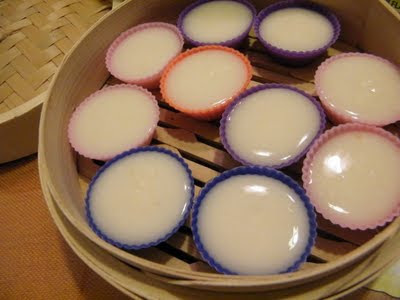 So, even with the absence of lye water and use of Pandan Flavour (instead of Extract), how was the taste? My wife and mother-in-law approves! Although it reminds me more of the macapuno balls sold in Baguio's sweets stores than pichi-pichi. I used macaroon-sized silicon moulds for my pichi-pichi, producing a yield of 48. My mother-in-law also noted that using brown sugar would be better as it will give a bit of colour to the pichi-pichi. 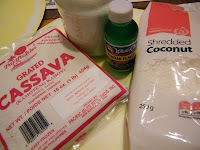 Place the cassava, water, sugar, and pandan in a bowl and mix thoroughly. About 5-8 minutes' worth of continuous mixing should do the trick. 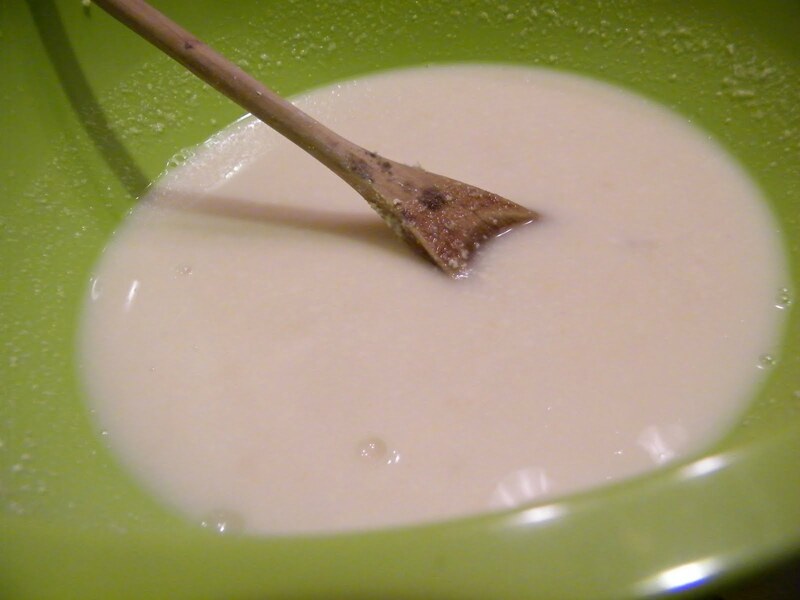 Cassava is starchy so you should see the mixture thicken up a bit and form a thin film on your spoon when you raise it. 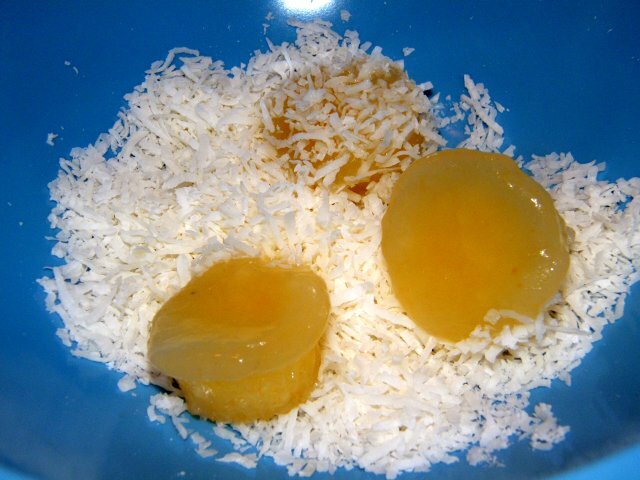 Place the mixture onto your moulds and steam for about 15-20 minutes or until the top is slightly thick and gelatinous in texture. Remove from the steamer, and let it cool a bit for easier handling, then pry off the moulds and drop onto a bowl with grated coconut meat. I found using a fork makes it easy to remove the cooked cassava from the moulds. Roll these onto the coconut meat for a nice coating. 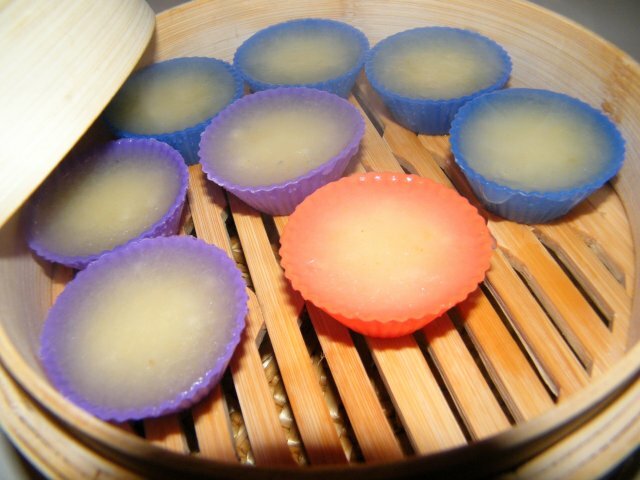 This can be served already after these have fully cooled, making the cassave pieces firmer and chewable. Now wasn't that easy? Mix, steam, and roll! This looks like a delicious dessert, nice with coconut rolled on top. oh, my, pichi pichi! love, love, love it.